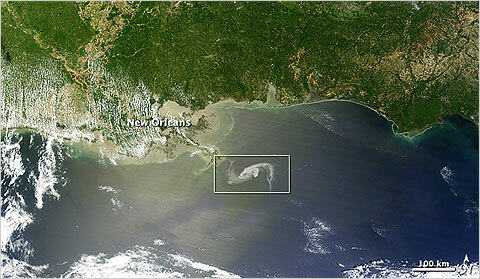 The oil spill moving toward the Mississippi Delta on April 29. Updated, Apr. 30, 3:15 p.m. | Coast Guard officials were investigating reports that the oil had washed ashore early Friday morning. President Obama ordered a freeze on new offshore drilling leases until an investigation was completed on the oil rig explosion and new safeguards were put into place. Gov. Bobby Jindal of Louisiana declared a state of emergency Thursday afternoon, saying that the vast oil spill in the Gulf of Mexico “threatens the state’s natural resources.” Federal officials were concerned that the slick could reach the Mississippi River Delta marshes by Thursday evening. The leak from the oil well, caused by an explosion on a drilling rig about 50 miles off the Louisiana coast, which left 11 workers missing and presumed dead, is estimated at 5,000 barrels of oil a day. Such a disaster is very rare, but the financial and environmental costs are clearly high when it occurs. Last month, President Obama proposed opening more areas of the Gulf coastline to oil and natural gas drilling. How should we balance the benefits of offshore drilling against the possible environmental damage? Are there technological advances that could be put in place? What much of the discussion of half million dollar valves reveals is that the theologians of the free market are often simply propagandists and rhetoricians rather than True Believers. If they were True Believers, they would understand that once the government requires more stringent precautiuons, the free market will take care of making it cheaper. Inventors will have an incentive to streamline and decomplicate the design and manufacture of the required valves, an incentive which they lack now. The updated satellite picture, from April 30, is on Terra Modis "Images" for yesterday. The picture in the op is from five days ago. While the updated picture clearly reveals that the spill has greatly expanded from five days ago, it is not, for some reason, an especially clear satellite picture. Edit: Reading the rather complicated accompanying text, it appears that this too is from five days ago. In any case, neither is an up to date picture.